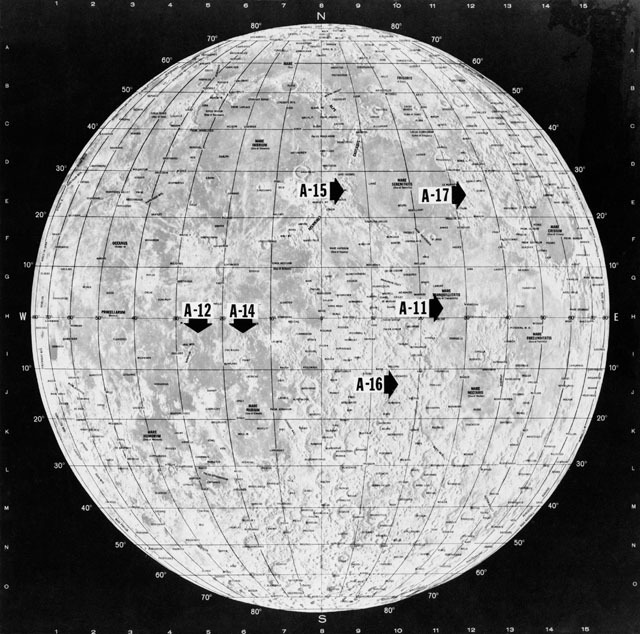 With four of the six planned lunar missions completed, this chart has been prepared to show the various areas of the lunar “nearside” to be visited by astronauts representing the NASA Apollo program. Apollo’s 11, 12, 14 and 15 are shown at their respective landing points. Apollo 16 and Apollo 17, planned for later this year at Descartes and Taurus Littrow, respectively, also are depicted on the map. The map was created in March 1972, prior to the launches of Apollo 16 and 17. All I can think is how good it would look printed large and mounted on the wall of my office. Yes…yes…. very good indeed. Here’s a useful Map for our studies on the Lunar surface temperature. Thanks LitD! Очень интересно ! Никогда раньше не встречал местоположения всех посадок Апполонов вместе с датами.